John Behan at work in his studio at Lr Canal Road, Galway. Artists can be very awkward at times. They don’t always conform to decisions made on their behalf. They rarely behave nicely if they disagree with authority. The Abbey Theatre, with trumpets blaring, announced its programme for 2016. A token female writer was included among a long male cast. The poor director, Fiach Mac Conghail, was booed off the stage. He barely escaped with his life. The Arts Council announces its grant allocation every year leading to riots in the streets because some funding has been cut, while others have been cut off. But for all their faults both the Abbey Theatre and the Arts Council are democratic institutions, and humane enough to admit mistakes, and to try to make amends in the future. There was a time, however, when the Arts Council was God, and it had enormous powers. It could snuff out artistic endeavour over a brief discussion at dinner in the Russell Hotel. In the 1960s when music, film, literature, art and dress code from Britain and America, began to influence the people of this far flung island on the edge of Europe, An Taoiseach Seán Lemass appointed a Jesuit priest Fr Donal O’Sullivan, director of the Arts Council. In some ways it was a brilliant choice. O’Sullivan, who sported a shot-silk waistcoat with black stone buttons, had some very good ideas for the dissemination of art throughout the island. He sponsored touring art exhibitions, notably ROSC, to bring art to the masses; and established the Kilkenny Design Centre. He instigated a scheme whereby the Arts Council purchased paintings and sculpture by Irish artists for re-sale at half-price to public institutions, and State sponsored bodies including schools, the banks, CIE hotels, and local authorities. The young sculptor John Behan, at 22 years of age had a bronze bull figure (made from metal found in the city dump ), accepted by the Irish Exhibition of Living Art in August 1960. It was a beautiful piece, but John had great difficulty getting it cast. That part of the work had to be done in England. He sent a proposal to the Arts Council to set up a Dublin Art Foundry. Such a facility would enable sculptors to cast bronze works in Ireland, without having to travel abroad to do so. They would be able to offer small works in bronze at affordable prices. The Arts Council, almost immediately, turned the proposal down. It claimed that such a foundry was ‘not viable’. John Behan, with others,** became awkward. They set up the Dublin Art Foundry anyway. It is still in existence, still viable, 40 years later. 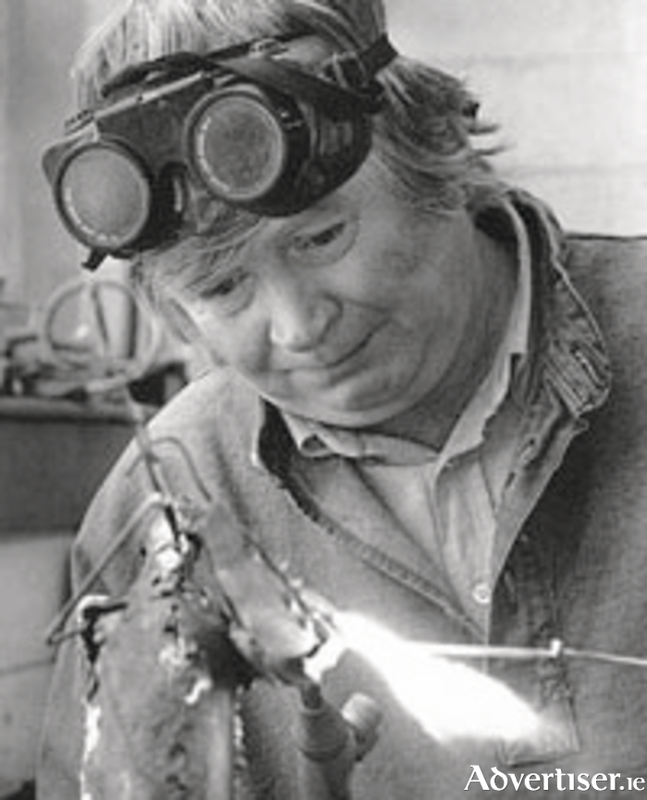 Today, with more than 5,000 of his works sold, John is regarded as Ireland’s greatest metal sculptor, whose work is recognised and enjoyed internationally. John’s art employs numerous representations: songbirds, crows, fish, boats, Icarus and Daedalus, but the iconic figure for him is the bull. Perhaps that is not surprising. His grandfather, known as ‘Black Jack’ Behan, was a farmer and cattle dealer in Ballybrittas, Co Laois. John spent his summers there. Farm implements were the first tools he learned to handle. His grandfather did not have his own bull. Once, when it was time to breed the cow, he brought along his grandson to a neighbour who kept a bull. The subsequent operation, John recalls, was impressive to behold. John has sculpted bulls, powerful, rooted creatures, all his creative life. The late Dr Emer MacHale’s father, Joe, had no other life but medicine. There were always, always, patients waiting either in the old fashioned ‘waiting room’ or standing in the corridor outside. It is said that half the babies in the Claddagh were born into his caring hands. Once he delivered two babies during one hot summer’s night, because neither mother would let him home. When once a year Joe’s family insisted that they take a week’s holiday together, they would sit in the car, parked behind the house on Raleigh Row, and wait for the doctor to slip out, like a fugitive, and bolt for freedom. His locum would cope as best as he or she could. His daughter Emer had her father’s kindness. John Behan fell in love with her some years after he came west, and settled in Galway. He originally came here mainly because the Kenny Gallery was selling his work, he was sad after the breakup of his marriage, and he was excited by the emerging arts scene, and Galway’s, unique at the time, art’s festival. Other talented artists and writers were moving to Galway at the time, including the playwright and novelist Tom Kilroy, the poet Gerald Dawe, artist Brian Bourke and his partner Jay Murphy; while Connemara’s attractive village of Roundstone was the inspirational setting for a number of older artists, including George Campbell, Gerry Dillon and Arthur Armstrong. Together with Emer, they travelled the world; John with his sketch book at hand. He is always busy, either with commissions, or working on his own themes inspired by Seamus Heaney, the Tain, a flock of birds, the Greek myths, or a poem that caught his fancy. After Emer’s untimely death in December 2012, John produced an extraordinary amount of work, both sculpture and drawings. This latest burst of creativity is on show at the Kenny Gallery, Liosban. It should not be missed. Fr O’Sullivan was right about John. His work is not refined, abstract, nor made of gold, but you marvel at how metal can be shaped so delicately. Each individual piece sings a song loud and clear. NOTES: * They are many interesting stories about Fr O’Sullivan. It is believed that for many years he was romantically involved with Catherine Walston, the beautiful, free spirited wife of a wealthy British financier, whose overlapping relationship with the writer Graham Greene, also a Catholic, inspired Greene’s novel The End of the Affair (1951 ). ** Some of the other artists associated with John at this time, included Michael Kane, Charles Cullen, Ron Watson, Marianne Heemskerk, and John Kelly. I am leaning on Adrian Frazier’s John Behan - The Bull of Sheriff Street, for this week’s Diary, published by The Lilliput Press, on sale €25.